On the 16th (Sun), see the interesting displays at Rosala Viking Centre and then visit a coastal fixture at Bengtskar Lighthouse. For more things to do, reviews, photos, and tourist information, refer to the Rosala day trip planning website . New York City, USA to Rosala is an approximately 20.5-hour flight. You'll lose 7 hours traveling from New York City to Rosala due to the time zone difference. Traveling from New York City in December, expect Rosala to be a bit cooler, temps between 34°F and 25°F. 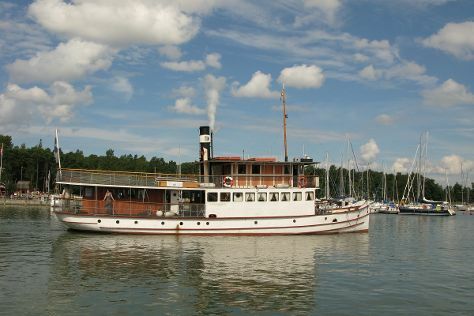 Wrap up your sightseeing on the 16th (Sun) early enough to travel to Naantali. Naantali is a town in south-western Finland, known as one of the most important tourist centres of the country. Kick off your visit on the 17th (Mon): pause for some serene contemplation at Archangel Michael's church, then enjoy the sand and surf at Ispoinen Beach and Sauna, then enjoy some diversion at Flowpark, and finally test your problem-solving skills at popular escape rooms. On the 18th (Tue), you'll have a packed day of sightseeing: trek along The Archipelago Trail and then find something for the whole family at Vaski Adventure Island. For maps, other places to visit, and tourist information, you can read our Naantali road trip planning website . Getting from Rosala to Naantali by car takes about 2.5 hours. In December in Naantali, expect temperatures between 34°F during the day and 25°F at night. Finish up your sightseeing early on the 18th (Tue) so you can travel to Uusikaupunki. On the 19th (Wed), take in the architecture and atmosphere at Uusikaupunki Old Church, see the interesting displays at Bonk Museum, and then examine the collection at Automobile Museum. To see traveler tips, more things to do, ratings, and tourist information, refer to the Uusikaupunki online visit planner . Traveling by car from Naantali to Uusikaupunki takes an hour. December in Uusikaupunki sees daily highs of 34°F and lows of 25°F at night. Cap off your sightseeing on the 19th (Wed) early enough to travel back home.